BACKHOUSE, H. F., Rifleman, 15th London Regt. Joining in April 1916, he served in France, at Salonika, and in Egypt. He took part in the Advance in Palestine in 1917, and was in action at Gaza where he was wounded. He was subsequently present at the Capture of Jerusalem and of Jericho. Returning in June 1918 to the Western Front, he took part in the great Advance, giving his life for King and Country at Neuve Eglise on September 4th, 1918. He was entitled to the General Service and Victory Medals. 58, Sportsbank Street, Catford, S E.6. BACKHOUSE, J., Private, 4th Bedfordshire Regt. Volunteering in February 1916, he embarked for France in the following May, and fought in many important engagements. He was in action throughout the German Offensive of 1918, and severely wounded in August of that year, was admitted into hospital. He subsequently died from his injuries on September 1st 918, at Rouen, and was entitled to the General Service and Victory Medals. 58, Enid Street, Rotherhithe, S.E.16. BACON, D. J., Private, l0th London Regiment. Volunteering in October 1915, he landed in France in November of the following year, and was in action at Vimy Ridge, Ypres, and Cambrai, where he was reported missing, but later this was disproved. He was engaged in heavy fighting during the Offensives of 1918, and was twice wounded and also gassed. He was demobilised in December of the following year, and holds the General Service and Victory Medals. 54, Peckham Park Road, Peckham, S.E.15. BACON, W. J., Private, l0th East Surrey Regiment. Volunteering in December 1914, he was drafted to the Western Front in the following August, and after serving at Fricourt and Bray was attached to the 183rd Tunnelling Company, Royal Engineers. He served in many parts of the line including the Somme sector, and in March 1918, was invalided home owing to ill-health. On his recovery he was stationed at various depots until demobilised in February 1919, holding the 1914-15 Star, and the General Service and Victory Medals. 48, Lenthrop Road, Greenwich, S.E.10. BADELOW, C. W., Gunner, R.G.A. He volunteered in January 1916, and proceeding to France in the following December was in action in the Battles of Arras, Ypres, and Cambrai, and throughout the German Offensive and Allied Advance of 1918. Returning home after the Armistice he was demobilised in November 1919, and holds the General Service and Victory Medals. 44, Bowles Road, Old Kent Road, S.E.1. BADELOW, S., Driver, R.A.S.C. (H.T.) Mobilised in August 1914, he was sent to the Western Front, and was in action in the Retreat from Mons, and the Battles of the Marne, the Aisne, La Bassee, and Ypres. Whilst he was taking ammunition to the front lines, his horses, frightened by shelling, bolted into a river and he was unfortunately drowned. He was entitled to the Mons Star, and the General Service and Victory Medals. 44, Bowles Road, Old Kent Road, S.W.1. BADELOW, S., Corporal, Royal Fusiliers. He volunteered in August 1914, and drafted to the Western Front was engaged in heavy fighting in various parts of the line. Wounded he was sent to a Base hospital, and on his recovery was transferred to Salonika. Here he fought in many important engagements, and contracting malaria was invalided to England. Later he proceeded to France and was in action throughout the German and Allied Offensives of 1918. He was demobilised in February 1919, and holds the 1914-15 Star, and the General Service and Victory Medals. BAGSHAW, A. E., Special War Worker. He offered his services for work of National Importance, and from 1915 until the cessation of hostilities was employed at Woolwich Arsenal on the manufacture of munitions of all descriptions. He rendered valuable services, discharging his duties in a most efficient and satisfactory manner throughout. 55, Glenforth Street, Greenwich, S.E.10. BAILEY, A., Private, 11th Hampshire Regiment. Volunteering in June 1915, he landed in France in the following January, and was in action in the Battles of Loos, St. Eloi, Albert, Vermelles, and Vimy Ridge. Severely wounded whilst on wiring duties between the lines at night, he was admitted into hospital, and died from his injuries on May 30th, 1916. He was entitled to the General Service and Victory Medals. 37, Wrigglesworth Street, New Cross, S.E.14. BAILEY, A. J., Rifleman, 3rd K.R.R.C. He volunteered in January 1915, and four months later embarked for France, where he fought at Festubert and Armentieres. In November of the same year he proceeded to Salonika and took part in the first battle of the Vardar, the Offensive on the Doiran front, and the Advance across the Struma, in which be was wounded. After his recovery he remained in the Balkans until the cessation of hostilities, and was demobilised on returning to England in March 1919. He holds the 1914-15 Star, and the General Service and Victory Medals. 20, Neuchatel Road, Perry Hill, S.E.6. BAILEY, B., Butcher, Merchant Service. He volunteered in October 1915, and was posted to s.s. "Edinburgh Castle," on board which vessel he was engaged on important patrol duties in the North Sea. Transferred in 1918 to s.s. "Arlanza," he was on similar duties until after the cessation of hostilities, finally being demobilised in February 1919. He holds the General Service and Mercantile Marine War Medals. 51. Acacia Road, Lower Sydenham, S.E.26. BAILEY, C., Bombardier, R.G.A. He was mobilised in August 1914, and proceeding to France fought in the Retreat from Mons, and in many other important engagements. Whilst in action in the first Battle of the Somme he was severely wounded and invalided home. After receiving hospital treatment, he was discharged as unfit for further service in 1916, and holds the Mons Star, and the General Service and Victory Medals. 77, Amersham Vale, New Cross, S.EI4. BAILEY, C. P., Petty Officer, R.N.D., Royal Fleet Reserve. A reservist he was mobilised at the commencement of hostilities and drafted to Belgium saw much service at Antwerp. In 1915 he proceeded to Gallipoli, and after fighting in many engagements was killed in action on May 12th, 1915. He was entitled to the 1914 Star, and the General Service and Victory Medals. "Courage, bright hopes, and myriad dreams splendidly given." 28, Cornick Street, Rotherhithe, S.E.I6. BAILEY, E., Driver, R.F.A. Volunteering in October 1915, he landed in France three months later, and was engaged in heavy fighting at Loos, St. Eloi, Albert, Vimy Ridge, and the Somme. Owing to ill-health he returned to England and after receiving hospital treatment was discharged as unfit for further service in June 1917. He holds the General Service and Victory Medals. 50, Pomeroy Street, New Cross, S.E.14. BAILEY, E., Private, Middlesex Regiment. He joined in 1917, and later in that year embarked for France, where he was in action in the Ypres Salient and on the Somme. He was engaged in heavy fighting throughout the German Offensive and subsequent Allied Advance of 1918, and returning home after the cessation of hostilities was demobilised in October 1919. He holds the General Service and Victory Medals. 93, Childeric Road, New Cross, S.E.14. BAILEY, E. R., Private, Royal Fusiliers. He volunteered in June 1915, and was sent to the Western Front in the following year. He was in action at Loos, St. Eloi, Albert, and Vimy Ridge, and was severely wounded. Returning to England, he received hospital treatment, and was invalided out of the Service in January 1919. He holds the General Service and Victory Medals. 61, Glamorgan Street, Grosvenor Road, S.W.1. 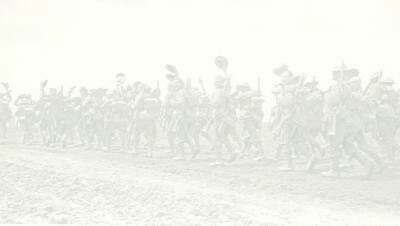 BAILEY, F., Private, York and Lancaster Regiment and R.A.S.C. He joined in October 1916, and in the following January was sent to France, where he was in action at Arras, and Messines, and was wounded. On his recovery he returned to the front, and was again wounded in the Ypres Salient. Invalided home he received hospital treatment, and was discharged as unfit for further service in January 1919. He holds the General Service and Victory Medals. 5, Clifton Crescent, Peckham, S.E.15. BAILEY, F. C., Rifleman, 16th London Regiment (Queen's Westminster Rifles). He joined in April 1916, and later in the same year was drafted to France, where he was in action at Arms, Bullecourt, Ypres, Passchendaele and Cambrai. He was also engaged in severe fighting throughout the Retreat and Advance of 1918, and returning home after serving with the army of Occupation in Germany, was demobilised in March 1920. He holds the General Service and Victory Medals. 26, Daniels Road, Peckham, S.E.15. BAILEY, F. W., Private, 8th Norfolk Regiment. He volunteered in September 1914, and in the following year sent to the Western Front, was engaged in heavy fighting at Loos and Ypres. He laid down his life for the freedom of England at Hill 60, in September 1916, and was entitled to the 1914-15 Star, and the General Service and Victory Medals. BAILEY, G., Sapper, R.E. He joined in April 1916, and was sent to the Western Front later in that year. He was in action on the Ancre, and at Messines, and was engaged on important duties in the front lines throughout the Retreat and Advance of 1918. He was demobilised in February 1919, and holds the General Service and Victory Medals. 25, Elcot Avenue, Peckham, S.E.15.